WATERLOO – Students from Wilfrid Laurier University and the University of Waterloo will host 40 children during the 23rd Arts Express summer camp July 4 to 8. The camp will conclude with a performance of the musical play “Adventures in Story” at the Maureen Forrester Recital Hall on Laurier’s Waterloo campus July 8. Arts Express is an inclusive summer camp experience for children with special needs and their siblings and friends. This program offers children ages six to 14 the opportunity to explore music, art, dance and drama in a setting that focuses on each child’s unique abilities and capacity for creativity through the arts. The arts portion of the camp is taught by a full-time faculty member at Conestoga College who has been involved in the camp since the program's outset. Camp activities will be led by students from a variety of faculties at both Laurier and UW who are enrolled in a Laurier music therapy course called “Inclusive Arts for Children.” Students who take the course have a strong interest in working with children and various special populations. The course teaches students how they can integrate the arts into their work. “The children who attend the camp are fortunate to be guided and led by dedicated students who have been working extremely hard to plan and prepare for the camp," said Elizabeth Mitchell, instructor in Laurier’s Faculty of Music and program coordinator for Arts Express. 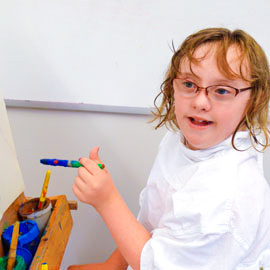 Arts Express was established in 1993 between Laurier, KidsAbility, Conestoga College’s Early Childhood Education program, the University of Waterloo and Carousel Dance Centre. The weekday camp takes place at KidsAbility in Waterloo. The final performance will be held at 1:30 p.m. on Friday, July 8 at the Maureen Forrester Recital Hall on Laurier’s Waterloo campus.